Irvine is the "promised land" if you are a Vietnamese restauranteur. It's far enough from the frenzied competition of Little Saigon so that you don't have to compete solely on price. Coupled with that, the audience of diners in Irvine aren't as finicky. You're not dealing with those ardent old timers, who spend all day reminiscing about how food used to taste in the old country. Nope. Here in Irvine, all you have to do is serve some decent pho, spring rolls, a few rice dishes, and charge just enough to cover the sky-high rent. If the stars align, you can make a good profit catering to a market of affluent homeowners, the office-park lunch crowd, and discriminating college students. If this sounds simple, it's not. Because for every success like Pho Bac Ky, there are casualties like Nam Viet. Now a new contender enters the ring. Occupying a space that used to house a failed Asian eatery before it, Saigon Grille attempts to lure Irvine diners with an eclectic menu and a 20% discount off the total bill to mark its grand opening. Their menu is stocked with big ticket items like baked catfish and crab noodle. These are ambitious dishes with prices to match. Perhaps they needed to pay off the interior designer, who from the look of things, must have run up quite a tab. They've built an elegant space which evokes a time of French colonialism and opulence. Sumptous red paint and intricately framed artwork decorate a room with open-backed wooden chairs and swooping ceiling fans. The centerpiece of the restaurant is an angled window that looks into the kitchen where a fiery wok blazes as the chef tosses his food airborne and the flames lick the ceiling for maximum dramatic effect. We started with the Grill Platter ($14.00), which are the Vietnamese equivalent to fajitas. Instead of tortillas, you are served a plate of cold, moistened rice paper, each sheet separated from the other with a plastic clam shell fan. The objective is to take a round of the transculent rice paper sheet, pile on a mound of cold and fluffy bun (vermicelli noodle), some herbs like mint and cilantro, some pickled carrot, and finally, the grilled meats of shrimp, pork, and beef. If you have great dexterity, you end up with a taut cigar-shaped object. But, if you're all thumbs like I am, you get something that resembles an exploded taco. Then you dunk it into the bowl of tart nouc cham (sweetened fish sauce), a sauce that emboldens the roll with a fishy pungency. Double dipping is allowed and necessary for every bite you take of your creation. 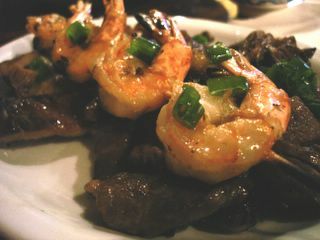 It's a fun, interactive meal which is relatively healthier than the ubiquitous Mexican restaurant staple it resembles. The cold noodles and herbs contrast the char-grilled meat making for a hearty dish that's also refreshing and light. 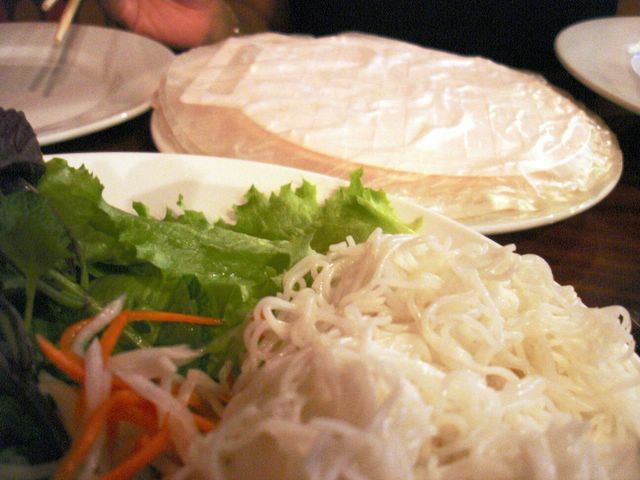 The rubbery pull of the rice paper gives it a pleasant chew and bite. 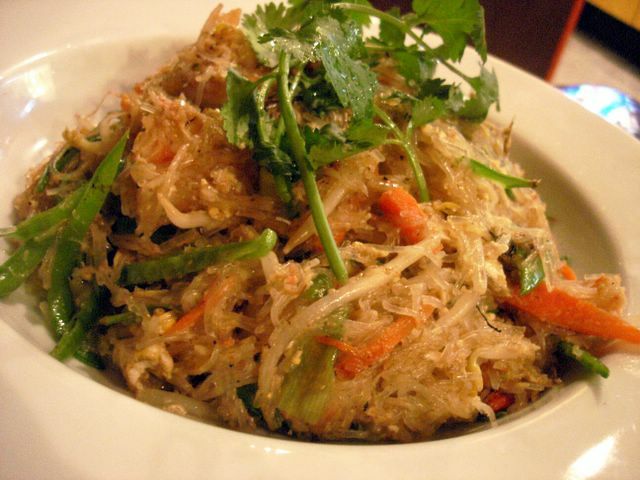 The next dish was the Mien Xao Cua ($15.95) (Stir Fried Vermicelli Noodles with Crab Meat). We would have loved Saigon Grille's rendition more had we not already tried a far superior execution at Brodard a few weeks ago. While Brodard's Mien Xao Cua was bold, saucy, with jewel-like chunks of crabmeat, Saigon Grille's was muted and damp. The crabmeat was almost entirely invisible since it was overworked and pulverized into thin, hairlike strands. Though the inclusion of almost raw pieces of finely julienned snow peas kept the dish interesting with its fresh-from-the-garden crunch. Although it remains to be seen whether these unorthodox dishes will be accepted by the Irvine crowds, Saigon Grille still wisely offers the requisite bowls of pho and com tam (Broken Rice with Meats) to please the city's demographic. 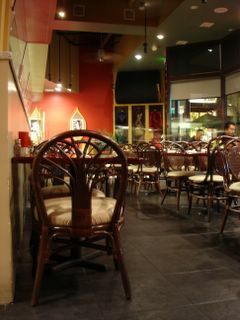 In fact, the restaurant was bustling that night and just about everyone had steaming hot bowls of pho in front of them. This Irvinite will be back to try a bowl too. Hi Elmo - I really enjoy those make your own spring rolls dishes, except I probably have even less dexterity then you, and after dipping in the Nuoc Mam, I end up a sticky mess....yours truly will never be a sushi chef! Looks like an interesting try at an upscale "white napkin" Viet Restaurant. I passed by Saigon Grille the other night too when I went to "Tri-Village" for chinese food at the same plaza. (Tri-Village is really good by the way, cept the price is a little jacked up) I saw that SG has fried shrimp cake and bun mo hua! I'll definitely check it out next time hehe. Very Very interesting! Do you happen to have THE recipee for New England Clam Chowder? I miss that so much from the US, as well as MExican food (your lengua entry made me salivate!!!! Hey Elmo, speaking of finding Vietnamese food in places other than Westminster-- have you ever been to Bamboo Bistro? It's in Corona del Mar. Pretty pricey for what you get, but I was impressed. I do well with fajitas, peking duck, even lettuce cups with the diced squab...but these rice paper rolls are so delicate and you always want to stuff much more into it than it can handle. Good stuff though. I noticed "Pho Irvine" taking over Nam Viet's spot. Been kind of worried that it wasn't much better than Nam Viet. Now that you say it's good, I'll be sure to try it. Ditto on Tri-Village. Unfortunately I haven't got a good recipe for New England Clam Chowder. Sadly, I usually take mine out of a Campbell's soup can when I can't get it from a restaurant. But here's a favorite video recipe of mine from Jasper White for New England Fish Chowder, recorded on Julia Child's Cooking with Master Chefs. Bamboo Bistro eh? I'll have to look that up and check it out. Thanks! Thanks for checking this place out! I've been wondering how it stacks up against the rest of the Irvine Vietnamese restaurants. I wonder if the crab noodles will be any good? Actually I did try the crab noodle, which is that stir fried dish in my photo. However, I think you should be interested in knowing that they also have the crab noodle soup "Bun Rieu"...wait, don't quote me on that...my memory is fading fast. Too bad you've stopped posting on your blog. I just discovered it now and would've loved to know more about your noodle soup finds in OC. You know, I passed this place up when they just opened because it had this empty vibe to it, and I just wasn't in the mood. But you've definitely got my curiousity piqued. I think I'll have to give it a go this weekend. Haha! Elmo, I love the way you describe how difficult those spring roll wrappers are. I have trouble with them too. Oops, I forgot to tell you, I really enjoy your site! I just found it through Kirk's and Dylan's sites. You take wonderful pictures and have very descriptive posts. Hope it doesn't disappoint when you try it out. It won't be as cost-effective as Pho Bac once they take away that 20% Off Grand Opening Special, so right now is definitely the best time to take it for a test drive. Thanks for the compliment! I've just discovered your site by you posting on mine. Your "mutated franken-fritters" actually don't look half bad. My wrap-job made it look more like pot-bellied little tacos at best, and an overloaded garbage bag at worst. I will try this soon. Normally I'm a Pho Bac Ky devotee. Reliable, if sometimes greasier than home made. Nam Viet was strange. Lost a good coffee place there, then it sits empty for months and months (is this perhaps Irvine red tape?). Then it was never open when I wanted to try it. Finally, I found it open, and had a lackluster meal there. So of course I didn't go back. Sad to see someone dump all that money into a place, and then not be able to make a go of it. Ditto. I'm weary of trying Pho Irvine, which took Nam Viet's place. Pho Bac Ky is still my go to place for pho in Irvine, although Saigon Grille's quite decent. Hi Elmo. We agree that the decorations of Saigon Grille is absolutely beautiful. You'd be amaze to know though, that the owner, Chinh Tran, did it himself without the help of an interior designer. He is a friend of ours and we told him when he first opened that if he does not make it in the restaurant business, he should consider a second career as a designer.